The workshop is free of charge, there are limited places, please register below. This workshop explores encountering fellow strangers in the city. Urban Hitchhiking is a project that reimagines the traditional concept of hitchhiking: instead of hitching a ride in a vehicle, the hiker hitches a walk in the company of a pedestrian. The purpose is to encounter a random passer-by and share a moment with them. The experience of non-verbal communication is in the centre of the workshop. Urban Hitchhiking presents a situation where the hitchhiker becomes visible in the space and offers an invitation to being encountered. We will explore ways of moving into a shared social space through bodily gestures, boundaries, negotiation and charming. What are the types of intuitive interpretations that we make before even consciously realising them and how do these ideas guide the body to encounter someone else’s world as a hermeneutical process? How is trust built and how to remain open for opportunities in the moment? Tuuli Malla is a performance and installation artist collaborating with people, places and other beings. She is also in the band Maria Inkoo and an urban researcher in artistic terms. 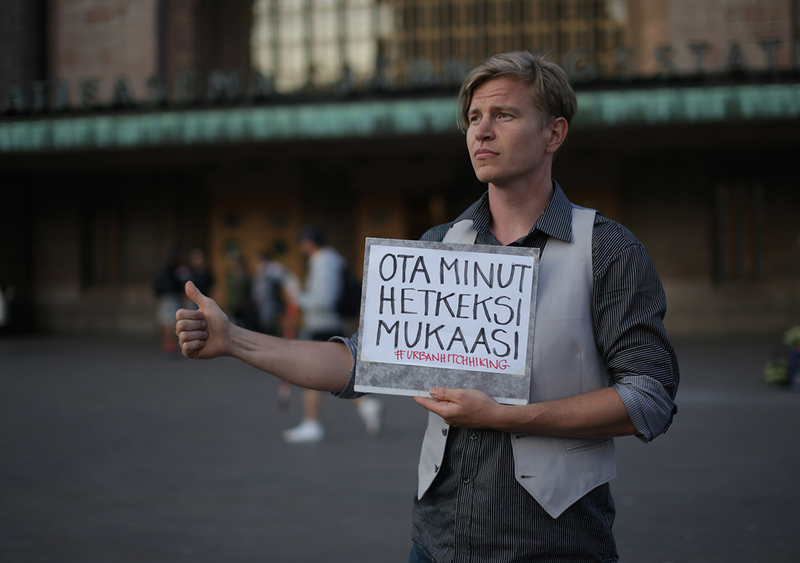 Lauri Jäntti is a cultural researcher, an urban activist and an encounter artist. He also enjoys to dance and organizes different space relational dance events. More information on their work together.